Oh our horses and ponies do like to try us at times, but if you want to get out and about, inevitably they have to learn how to load. These are my tips. When I take my horse out I do put travel boots on – some riders don’t like them, for me it gives me peace of mind. If your horse has never had them on before you may want to let them practice walking with them, it can sometimes take a while for them to get used to them on their legs. We have a trailer. I make sure it’s ready to rock and roll before I load. 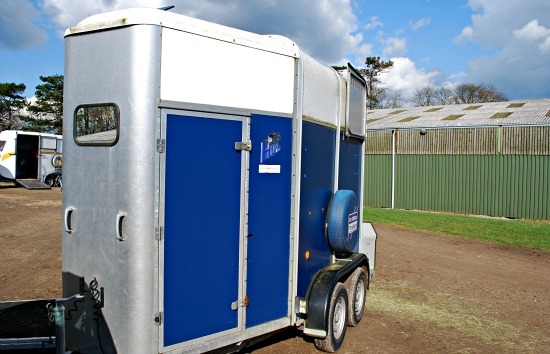 All the relevant bars are up or down and the ramp down – it means when we come round the corner and see the trailer we can just walk straight on, I find if we pause the horse plants itself and then the problems begin! Some horses will just pop on whilst being led no fuss, others will need a bit more persuasion. I’ve held carrots out – just in front of the horse so that he follows it. Myself and a friend have held lunge lines around the back of the horse to encourage it forward. I’ve also encouraged a horse to load by holding a schooling whip – I don’t have to use it but the sight of it sends him on. Sadly there’s no hard and fast rule – just be patient and know your own animal. At present I have a youngster that I’ll want to take out his summer to some in hand youngstock classes. When she came home we got her on the trailer but she didn’t enjoy it one bit. Soon I’ll be practicing leading her onto it and either not going anywhere, just giving her her tea on it, or taking it out for a stress free poddle around the block. The more they get used to it, the space, the sensation the less stress they’ll hopefully be. I like that tip to use carrots to lure a horse onto a trailer. That’s a good use of positive reinforcement. I heard that the use of blinders is valuable in trailers as well.